How do you create a cooperative and collaborative classroom? One way to achieve this is to provide a group of puzzles where students can work either independently, with a partner, or in small groups. This approach engages students in a fun activity while learning at the same time. When working in pairs or as part of a small group, students learn from each other as they work together to solve the puzzles. 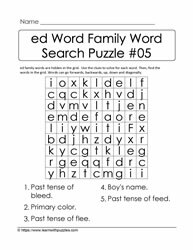 This ed word family and rhyming words activity includes a series of word search puzzles of increasing complexity. 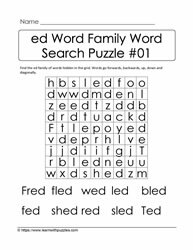 Puzzles vary from: including a list of words with regular spelling, to a word search puzzle with scrambled letters for each word in the list, to a brain teaser where there are no words listed. 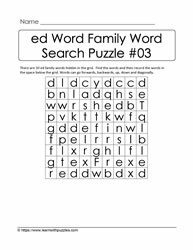 This later word search puzzle requires a basic foundation of this word family. 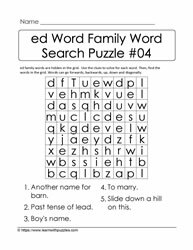 The last category word search puzzle requires students to solve a crossword like clue. 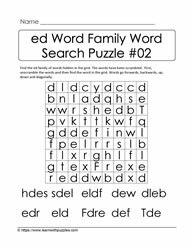 It is recommended that students record the answer before finding the words in the grid.